Ebullient words of praise flow like the Colorado River. 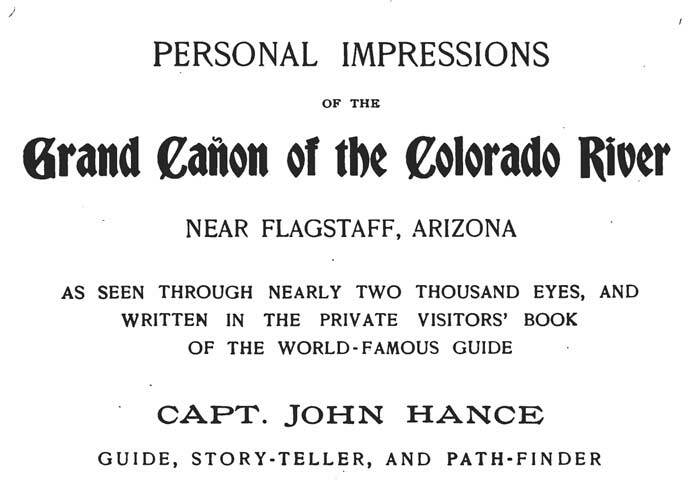 Even the title of the book is positively breathless: Personal Impressions of the Grand Cañon of the Colorado River Near Flagstaff, Arizona: As Seen Through Nearly Two Thousand Eyes, and Written in the Private Visitors’ Book of the World-Famous Guide Capt. John Hance, Guide, Story-Teller, and Path-Finder. 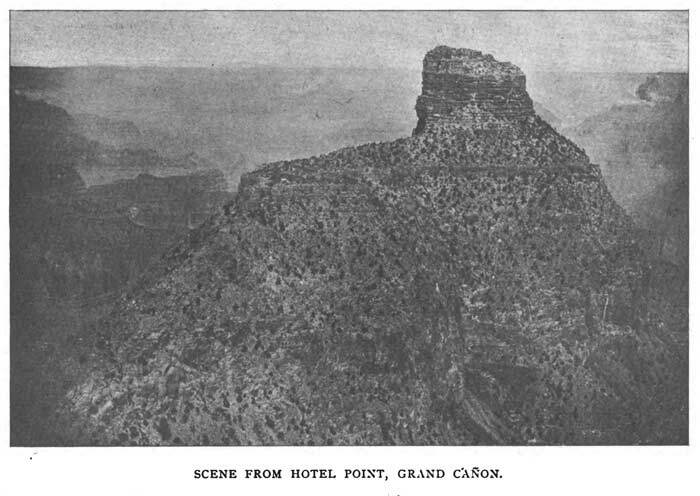 The first-person narratives in Personal Impressions reveal how those visitors perceived, contextualized, and understood the canyon. There is probably some selection bias at work — the book records no overwhelmingly negative reactions — but that selection bias is also illustrative. The passages that made the cut depict the canyon as its promoters would like it to be seen. In this post, I’ll kick things off with a selection of deadpan passages written by 19th-Century tourists. A brief note before diving into these quotations: I’ve edited some of them for length and punctuation; longer versions appear in Personal Impressions. Talk about holes in the ground — well, this is one of them. By Joe! This cañon takes the whole shooting-match. Magnificent, and much else also in addition besides. The cañon is all right. 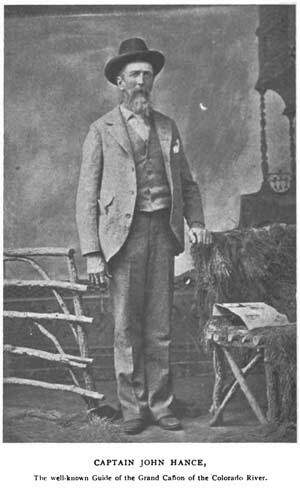 See the Grand Canon, and know Captain Hance, you will never forget them, sure thing. My only regret is that John Hance and I can’t make a longer stop at the boss ditch of the world. It’s a ditch of all ditches. That’s all. I have never witnessed anything like this. It scares me to even try to look down into it. My God, I am afraid the whole country will fall into this great hole in the ground. This is a warm place. I fainted when I saw this awful looking cañon. I never wanted a drink so bad in my life. Captain, I won’t forget you for bringing me the oyster-can full of water. Good-by. Those are the only two quotes describing outright fear, and they appear near the beginning of the book. There is a negligible chance that the incidence of American acrophobia peaked in July 1892. What’s more probable is that the book was front-loaded with such reactions, making Hance’s services seem all the more valuable. Mary Hart, who visited Grand Canyon and wrote on the subject. Photo source. There is a certain malady, commonly termed “big head,” with which a large number of otherwise healthy people are afflicted. Prescription: Stand upon the brink of the Grand Cañon, gaze down, and still further down, into its awful depths, and realize for the first time your own utter insignificance. I love this quote. Many of the testimonials attempt to capture the immensity of Grand Canyon; this one does it best. Other writers resort to florid descriptions of grandeur; Hart describes the canyon’s ability to dwarf titanic egos. The story of Mary Hart’s Grand Canyon visit doesn’t end in Hance’s guestbook. 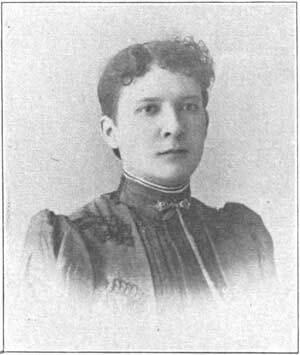 In September 1895 she presented a paper at a meeting of the Southern California Historical Society: “The Grand Cañon of the Colorado.” I’m currently trying to track down a copy of that paper.